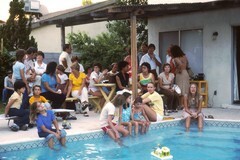 A large group of adults and children sitting around a swimming pool. They are members of a national group called the Candlelighters, which gives emotional support and practical advice to parents, patients and siblings of cancer victims. This group is in Las Vegas, Nevada and is one of more than 100 nationwide. The Candlelighters headquarters is in Washington, DC.